Father’s Day is only 4 days away!! Here’s a FUN and QUICK gift that any dad will love. We are big tootsie roll fans at our house….especially my husband. These white gift bags are so versatile! You can use them for so many different things. I used crepe paper to make the bow tie. I will be posting the tutorial for the tie bow tomorrow. It’s super simple! The glitter clothespin is totally OPTIONAL! But in our house, my husband wouldn’t think twice about it because the girls and I glitter pretty much everything! I don’t have a fancy silhouette yet so I did made the tag old school style…with the printer. There you go! 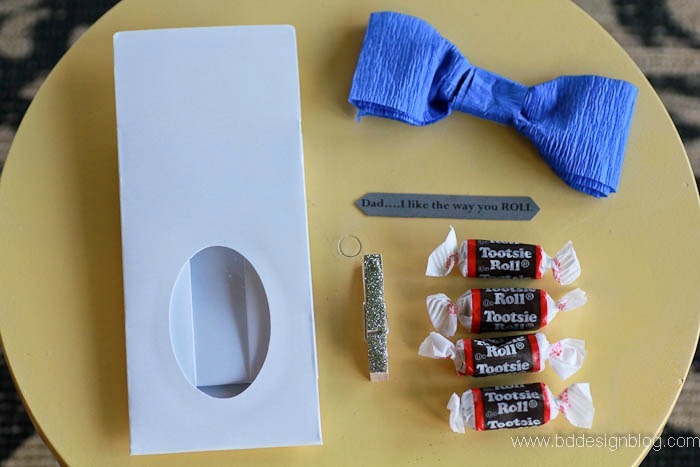 Now go get some tootsie rolls and let that special guy in your life know you like the way he ROLLS! If you still need more ideas, here’s a round up of more Father’s Day gift ideas I gathered from other talented bloggers! I wish I would have seen this before Father's Day. I think it is such a fun and simple gift! 🙂 Thank you for sharing it at The Creative Exchange! 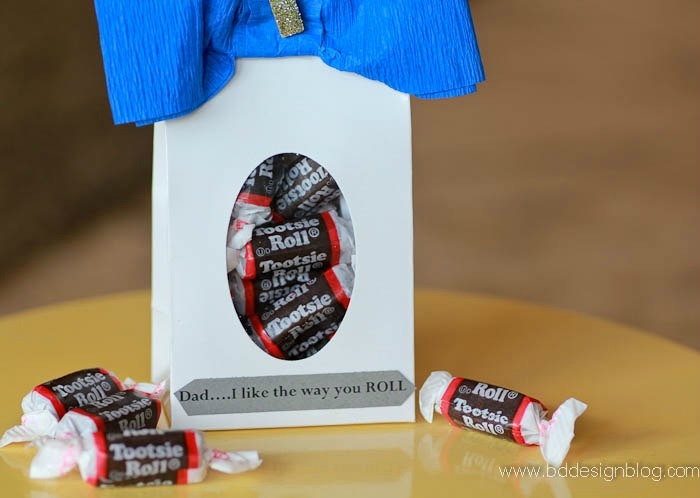 My dad LOVES tootsie rolls so this would be so perfect for him! This is the cutest idea! My kids love tootsie rolls but I don't let them have them very often. They would be thrilled to do this for Daddy!